Tying the worlds of Unbreakable and Split together, M. Night Shyamalan brings us a film that serves as direct sequel to both previous stories. Glass unites the invincible David Dunn (Bruce Willis), DID sufferer Kevin Wendell Crumb (James McAvoy), and the brittle-boned mastermind Elijah, now going by the name of Mr. Glass (Samuel L Jackson). Placing the film fifteen years after the events of Unbreakable and three weeks after those of Split, we pick up with David tracking down petty criminals, while the Horde – the personalities that have taken over Kevin’s identity – continues its murderous rampage. What’s clear from the off is this is a much more conventional ‘superhero’ film than either of its predecessors, the first act moving at a quite a clip relative to Unbreakable’s heavy, depressive pace. What hasn’t changed is Shyamalan’s visual flair. Split’s cinematographer, Mike Gioulakis returns, mixing uncomfortably intimate close-ups with vivid colour coding and low slung angles to invoke the look of comic panels. The result is one of the best-looking films in either filmmaker’s oeuvre – particularly in the film’s lengthy, asylum-set second act. It’s a good job the asylum looks good, though, as this is where the drama hits an inertia from which it never fully recovers. Unbreakable worked because the mystery around David’s extraordinary abilities framed a very grounded family drama. Equally, Split’s appeal lay not in the novelty of Kevin’s affliction, but in the discovery of his multiple personalities, their conflicting motivations and power plays with each other. Glass loses the mystery of both with familiarity, while wasting time asking whether its characters really are super-powered when we already know that they are. Meanwhile, three subplots involving Elijah’s mother (Charlayne Woodard), David’s son Joseph (Spencer Treat Clark, reprising his role from Unbreakable), and Kevin’s escaped victim from Split, Casey (Anya Taylor-Joy) have been evidently hacked to the bone, leaving them all but irrelevant. As a result, the ending – featuring of course the director’s trademark sleight of hand – ultimately is unsatisfying and feels strangely dated. It should be noted, too, that the depiction of Kevin’s DID – a real-life condition – is ludicrous and borderline offensive. McAvoy brings his all to the role, and it’s really a treat watching him transform himself from 9-year old boy to middle-aged woman to freakish man-beast through performance alone, but this depiction of mental illness is iffy at best. Furthermore, the film’s three women characters are all little more than maternal figures, as well as being lumped with the film’s most cringe-worthy dialogue (of which there is plenty to go around). 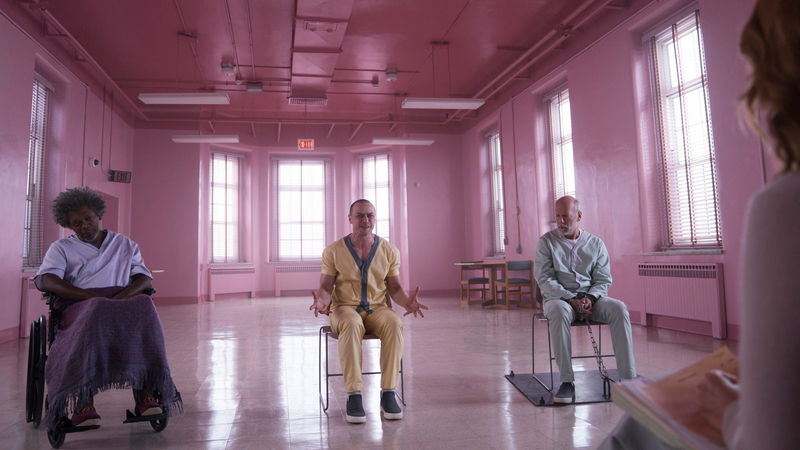 Despite its myriad issues, Glass is often a hoot to watch – particularly once Elijah comes out of his self-induced fugue to wreak havoc on the facility, with Jackson hamming it up with infectious relish, bouncing off the gurning McAvoy. The flaw in Glass’s surface is, ironically, its opacity. Instead of interrogating the structure of superhero narratives, Shyamalan uses it as a crutch, explicitly drawing attention to it whenever his story begins to topple. The effect is to obscure any thematic clarity or depth, making Glass an exercise in smoke and mirrors, and a rather fragile one at that.